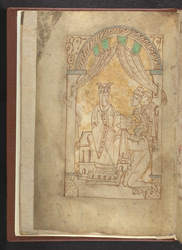 Emma of Normandy, twice Queen by her successive marriages to Aethelred II and Cnut, spent part of her life in exile under the protection of Count Baldwin of Flanders. To help promote the interests of her sons, Harthacnut and Edward (who became 'the Confessor'), she commissioned an exaggeratedly flattering biography of Cnut and herself around the time of Harthacnut's succession (1040). The 'Encomium' (panegyric or lofty praise) is an important early example of biography written in secular interests, in a period when 'lives' promoted sainthood, as well as providing a rare 11th-century narrative history. The only surviving medieval manuscript of the Encomium, this copy was made in Normandy, probably at St Omer and possibly for Emma herself. Written on the first page of the book, this later inscription refers to the work as 'The Deeds of Cnut' and records that it belonged to St. Augustine's, Canterbury. A typical St. Augustine's press-mark is to the right. The green blobs at the top have come through from the dedication portrait of Emma on the other side of the page.